Considering I don’t have any apple trees, I seem to have a creditable glut of apples going on right now. Multiple sources have handed over bulging bags full of home-grown apples. One of the benefits when people know that you do something food-related. I decided this probably meant that it was time I tackled the dessert I’ve so often fancied trying but never quite gotten round to - Tarte Tatin. It’s a relatively simple dish in theory. Caramel. Apples. Pastry. But for something so simple, there seems to be a lot of different ways to go about it. Some using puff pastry, some using shortcrust, some using pâte sucrée. Some making the caramel first, some not. Some using specific types of apples, and so on. Well, the variety of apples is taken out of the equation. I have what I have, and I don’t even know what they are. 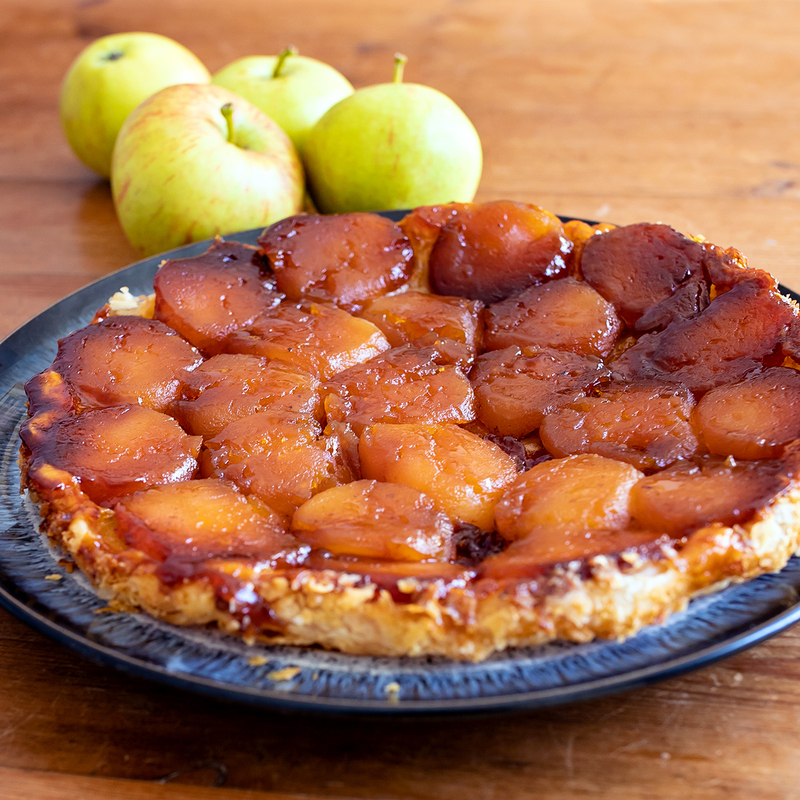 It’s hard to imagine any apples get cooked with beautiful brown caramel and don’t end up delicious to eat, so we’ll just go with it. Of course, they have to be eating apples, not cookers. We want them to keep their shape since for this dish, it’s the apples standing proudly together that makes it so distinctive and appetising. I opted to use puff pastry. I’d love to tell you that I made my own. Not yet. That’s another thing on the bucket list, but not for this. I used instead a bought all-butter puff pastry. It’s not that the pastry is that important here. It is purely a base for the apples. It came out fabulously well. The flavour of the apples with the caramel was great - a nice balance of sweetness and acidity. It looked gorgeous. Exactly how it should be. It’s fantastic eaten still warm accompanied with vanilla ice cream (or tonka bean ice cream) , but pretty sound at any time, to be honest. Roll out the puff pastry to about 3mm thick. Cut out a round the size of a large dinner plate (in other words, use the plate to cut around). Cover in clingfilm and place in the freezer. Peel, core and quarter the apples, and put to one side. Don’t worry about oxidation - you won’t know the difference either way once they’ve been coated in caramel. Pre-heat the oven to 180ºC / 160ºC. In a small sauce pan, melt and cook the butter to a medium brown caramel. Once it’s cooked, add the butter (watch out for spitting hot sugar) and mix it together. 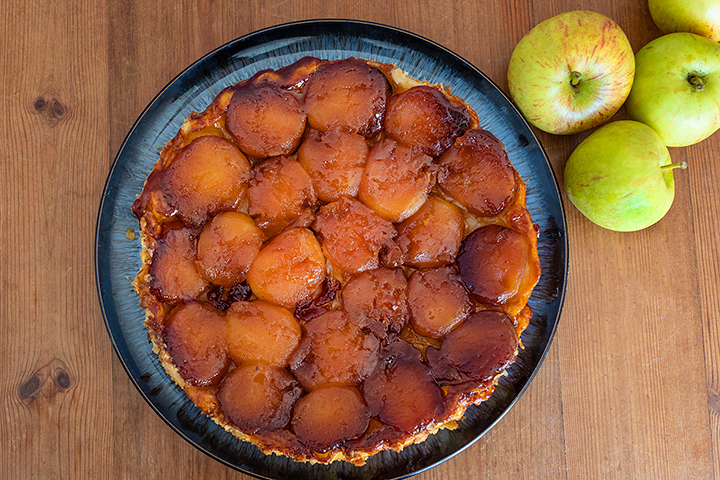 Pour it into the tarte tatin dish and arrange the apples, round side down, in circles as tightly as you can. Brush the exposed surfaces of the apples with melted butter and then place in the oven for about 30 minutes. Remove from the oven and place the frozen pastry round on top. It will defrost almost straight away, which will allow you to carefully tuck in the edges and prick a few holes in with a knife so that steam escapes when it’s cooking. Cook in the oven until the pastry is golden brown and crisp - it took about 20 minutes in my oven, but your mileage may vary. Once it’s done, remove from the oven and allow to cool a little. While it’s still warm, run a knife around the edge and turn it out onto a suitably large plate. You may have to replace the odd apple piece that gets dislodged in the process (I had just one). The only food waste here is the trimmings from the puff pastry. Hard to eliminate, but you should take steps to minimise it if possible. Unfortunately, if you’ve bought frozen pre-made puff pastry, then refreezing it for storage isn’t an option.